I first heard about Imperial College Operatic Society over a pre-show pizza in Sutton. I was intrigued to hear about iheir annual productions of G&S operettas in Budleigh Salterton, on the South East Devon coast and decided to join them for the 1996 production of "The Gondoliers". The cast, mostly current and ex students from Imperial College, rehearsed the show in London for two months before travelling to Devon at the end of July for a two week rehearsal and performance "Tour". The first three days of the fortnight consisted of final rehearsals, scenery construction, a "Sitzprobe" and numerous advertising events until the opening on the Wednesday evening. Nine further performances followed over the remaining period. In addition, a charity concert was held in the local church on the middle Sunday. The Society had been performing annually in the area since the late 1960's and had built up a number of traditions, both on and off the stage during that time. There were always the evenings in The Feathers pub after rehearsals and performances, and the late nights in The Scout Hut. Mario and Franco's Italian restaurant was usually oversubscribed on the evening set aside for the Society's visit there. The Society also had a tradition of awarding a tankard for reaching 100 performances, but I only got as far as 53! I performed four times at Budleigh Salterton, and also in a further two spring shows in the Concert Hall of Imperial College, London, in the shadow of the Albert Hall. 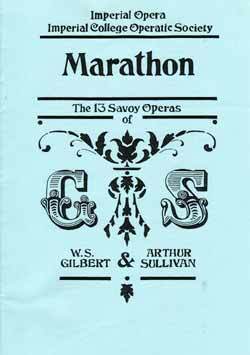 One further highlight of my time with ICOS was taking part in the G&S Marathon in 1998. The Concert Hall was the venue for 14 back-to-back performances of all of the Gilbert and Sullivan operas (Trial By Jury was performed first AND last). We performed all of the music and dialogue in a period of 31 hours during the May Bank Holiday weekend, and I fortunately had enough stamina to take part in all of the performances. I played four principal parts, the highlight for me being the role of Fairfax in "The Yeomen Of The Guard". The Society's current activities can be found at the Imperial College Operatic Society web site.